Fatty acids are comprised of hydrocarbon chains terminating with carboxylic acid groups. Fatty acids and their associated derivatives are the primary components of lipids. The length and degree of saturation of the hydrocarbon chain is highly variable between each fatty acid, and dictates the associated physical properties (e.g., melting point and fluidity). Moreover, fatty acids are responsible for the hydrophobic properties (insoluble in water) exhibited by lipids. Fatty acids have important roles in: 1) signal-transduction pathways; 2) cellular fuel sources; 3) the composition of hormones and lipids; 4) the modification of proteins; and 5) energy storage within adipose tissue (specialized fat cells) in the form of triacylglycerols. Fatty acids are involved in a wide range of biological signaling pathways. Following the dietary intake of polyunsaturated lipids, the products of lipid peroxidation can function as the precursors of powerful signaling mediators. Some examples of such signaling include eicosanoid production, the peroxidation of LDL, and the modulation of metabolic and neurological pathways. Of particular importance is the role of fatty acids in the formation of eicosanoids, which are a group of signaling molecules involved in the immune response. Eicosanoids consist of 20-carbon polyunsaturated fatty acids that form the precursors of various molecules responsible for platelet aggregation, chemotaxis, and growth factors. The dietary intake of polyunsaturated fatty acids can also result in the peroxidation of LDL. When peroxidized LDL is engulfed by macrophages, the resultant immune activation can lead to the development of atherosclerosis. Furthermore, increased intake of cholesterol, saturated and trans fatty acids has been linked to the development of several cardiovascular diseases. In contrast to the negative effects of LDL cholesterol, saturated, and trans fatty acids, the intake of both monounsaturated and ω-3 and ω-6 polyunsaturated fatty acids is associated with anti-inflammatory effects. In particular, these fatty acids increase the uptake of circulating LDL by the liver, and reduce leukocyte activation and platelet reactivity, lymphocyte proliferation, and blood pressure. Moreover, polyunsaturated fats are also required for normal growth and development, as well as the regulation of visual acuity and cognition in the central nervous system. Further beneficial effects of polyunsaturated fatty acids have been observed regarding the inhibition of cancer cell proliferation and anti-tumor effects in animal models. The metabolism of fatty acids involves the uptake of free fatty acids by cells via fatty acid-binding proteins which transport the fatty acids intracellularly from the plasma membrane. The free fatty acids are then activated via acyl-CoA and transported to: 1) the mitochondria or peroxisomes to be converted into ATP and heat as a form of energy; 2) facilitate gene expression via binding to transcription factors; or 3) the endoplasmic reticulum for esterification into various classes of lipids that can be used as energy storage. When used as an energy source, fatty acids are released from triacylglycerol and processed into two-carbon molecules identical to those formed during the breakdown of glucose; moreover, the two-carbon molecules generated from the breakdown of both fatty acids and glucose are used to generate energy via the same pathways. Glucose can also be converted into fatty acids under conditions of excess glucose or energy within a cell. Fatty acids are also used as a form of energy storage as fat droplets composed of hydrophobic triacylglycerol within specialized fat cells called adipocytes. When stored in this form, fatty acids are important sources of thermal and electrical insulation, as well as protection against mechanical compression. Fatty acids are the preferred form of energy storage over glucose because they produce approximately six times the amount of usable energy. Storage in the form of triacylglycerol molecules consists of three fatty acid chains attached to a glycerol molecule. One of the more critical functions of fatty acids is the formation of the cell membrane, which envelops all cells and the associated intracellular organelles. In particular, cell membranes are composed of a phospholipid bilayer made up of two fatty acid chains bound to glycerol and a hydrophilic phosphate group joined to a smaller hydrophilic compound (e.g., choline). 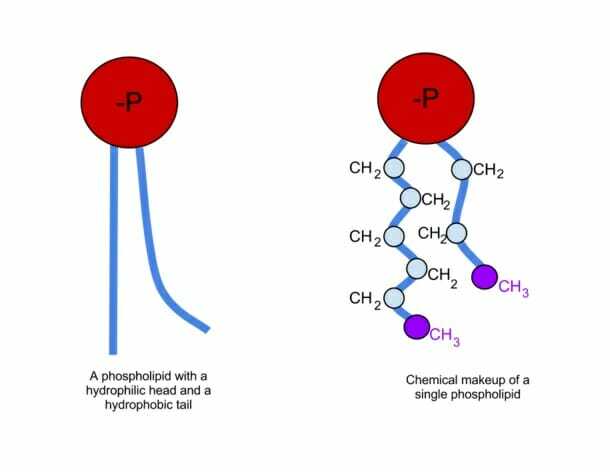 Thus, each phospholipid molecule has a hydrophobic tail composed of two fatty acid chains and a hydrophilic head comprised of the phosphate group. Cellular membranes are formed when two phospholipid monolayers associate with the tails joining in an aqueous solution to create a phospholipid bilayer. An important feature of cellular membranes is membrane fluidity, which refers to the viscosity of the lipid membrane. Membrane fluidity is influenced by the diversity of the lipid chains that comprise the cell membrane, including the length of the chains and the level of saturation. When the membrane fluidity changes, the function and physical characteristics of the membrane are also altered. For example, increased consumption of ω-3 fatty acids can increase the level of EPA and DHA in cell membranes. When such incorporation occurs in the cell membranes of retinal cells, there is an enhancement in light transduction. Moreover, increased ω-3 fatty acid accumulation in the membranes of red blood cells results in greater membrane flexibility, potentially resulting in improved microcirculation. Fatty acids play several critical roles via their interaction with various proteins. The acylation of proteins is an important function of polyunsaturated fatty acids, as it is critical for the anchoring, folding, and function of multiple proteins. In addition, fatty acids can also interact with various nuclear receptor proteins and promote gene expression, as several fatty acid-protein complexes function as transcription factors. In this manner, fatty acids have been found to regulate the transcription of genes related to metabolism, cellular proliferation, and apoptosis. Monounsaturated fatty acids contain one carbon-carbon double bond, which can be found at different positions throughout the fatty acid chain. The majority of monounsaturated fatty acids are between 16 and 22 carbons in length, and contain a cis double bond, meaning that the hydrogen atoms are oriented in the same direction, introducing a bend in the molecule. Moreover, the cis configuration is associated with thermodynamic instability and, thus, a lower melting point compared to trans and saturated fatty acids. Polyunsaturated fatty acids contain more than one double bond. When the first double bond is situated between the third and fourth or sixth and seventh carbon atoms from the carbon-oxygen bond, they are referred to as ω-3 and ω-6 fatty acids, respectively. Polyunsaturated fatty acids are produced only by plants and phytoplankton, and are essential to all higher organisms. Saturated fatty acids are saturated with hydrogen, and most are straight hydrocarbon chains with an even number of carbon atoms. The most common fatty acids contain 12–22 carbon atoms. Long chain fatty acids (C16 and greater) can be either saturated or mono/polyunsaturated depending on the presence of one or more double bonds in the carbon chain. 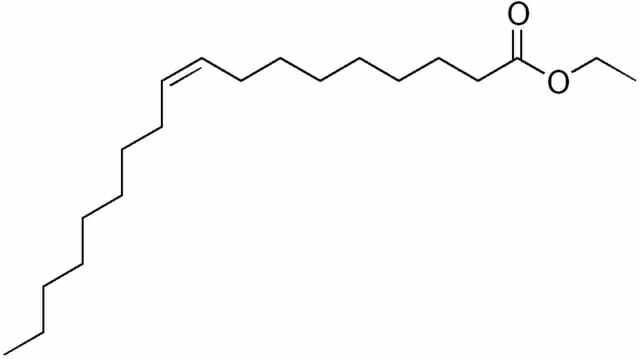 Oleate is the most abundant long chain monounsaturated fatty acid, with a chain length of 18 carbons and a double bond located between C9 and C10 from the methyl end (C18:1n-9). In addition, long chain fatty acids are insoluble in water and are circulated via the plasma either as an esterified complex, triacylglycerols, or non-esterified forms loosely bound to albumin. Short-chain fatty acids are the primary end products of bacterial metabolism in the human large intestine. Moreover, while short-chain fatty acids are formed from various precursors by anaerobic micro-organisms, carbohydrates are the most common progenitors of short-chain fatty acids. Fatty acids are composed of carbon chains containing a methyl group at one end and a carboxyl group at the other. The methyl group is termed the omega (ω) and the carbon atom situated next to the carboxyl group is termed the “α” carbon, followed by the “β” carbon, etc. Fatty acid molecules also have two chemically distinct regions: 1) a long hydrophobic hydrocarbon chain, which is not highly reactive; and 2) a carboxyl (-COOH) group, which is hydrophilic and highly reactive. In the cell membrane, virtually all fatty acids form covalent bonds with other molecules via the carboxylic acid groups. As described above, fatty acids can contain double bonds (unsaturated fatty acids) or no double bonds (saturated fatty acids) in the hydrocarbon chains. The presence of double bonds results in the formation of bends or kinks in the molecules, and impacts the capacity of the fatty acid chains to stack together. Other differences between fatty acids include the length of the hydrocarbon chains, as well as the number and position of the double bonds. The presence of the double bond will also influence the melting point, as unsaturated fatty acids have a lower melting point than saturated fatty acids. The melting point is also influenced by whether there is an even or odd number of carbon atoms; an odd number of carbons is associated with a higher melting point. Furthermore, saturated fatty acids are highly stable, while unsaturated fatty acids are more susceptible to oxidation. A. The length of the hydrocarbon chain. B. The number of carbons in the fatty acid chain. C. The presence of a double bond in the hydrocarbon chain. D. The lack of a hydrophilic phosphate group. C is correct. Unsaturated fatty acids contain at least one double bond, whereas saturated fatty acids are “saturated” with hydrogen. E is correct. All the listed systems require fatty acids. B is correct. Short-chain fatty acids are derived from the end products of bacteria colonizing the intestine. Alberts, Bruce, et al. (2002). Molecular Biology of the Cell, 4th. ed. Garland Science: New York. Berg JM, Tymoczko JL, Stryer L. (2002). Biochemistry. 5th ed. W H Freeman: New York. Eric Duplus, Martine Glorian, and Claude Foresti. (2000). Fatty Acid Regulation of Gene Transcription. The Journal of Biological Chemistry. 275(40): 30749–30752. Rustan, Arild C and Drevon, Christian A. (2005). Fatty Acids: Structures and Properties. Encyclopedia of Life Sciences. John Wiley & Sons: Oslo, Norway.